https://matcha-jp.com/en/greatertokyo/6541 Nikko Pass Trip Day 2 - Discover The World Heritage Sites Of Nikko! Nikko Pass is the most convenient discount ticket for exploring Nikko and its surroundings. We introduce an itinerary for the second day spent in Nikko, which includes a Lake Chuzenji Boat Cruise and visits to the World Heritage Sites. Nikko Pass - Save on Transportation Costs! Nikko is an area that boasts both breathtaking nature and a fascinating history which we owe the beautiful World Heritage Sites that made this city famous. The best way to fully enjoy the charm of this area is by spending at least two days here and using the convenient Nikko Pass. As introduced in our previous article, Nikko Pass comes in two versions - the All Area Pass (4,520 yen), valid for 4 days, which includes a round-trip to Nikko from Tokyo and unlimited bus and train transportation in Nikko, Oku-Nikko and Kinugawa Onsen, and the World Heritage Area Pass (2,000 yen), valid for 2 days, which covers a round-trip to Nikko from Tokyo and unlimited bus and train transportation in Nikko and Kinugawa Onsen. For further details on the Nikko Pass, please check this page. After spending your first day in Nikko exploring the beautiful nature that inspired the creation of temples and shrines in the area, we recommend spending your second day learning about the rich history of Nikko and visiting the World Heritage Sites of Toshogu Shrine, Rinnoji Temple and Nikko Futarasan Shrine. After checking out from Chuzenji Kanaya Hotel, take a few minutes to visit Lake Chuzenji Boat House, which is located right in front of the hotel on the lakeshore. Lake Chuzenji Boat House was built in the 1940s as an international resort. Members of the foreign embassies that owned villas around Lake Chuzenji, as well as tourists, used to enjoy boating, canoeing, and angling here. The facility is now managed by the Nikko Natural Science Museum, housing exhibitions on the fauna and flora of Lake Chuzenji. The terrace of the Boat House Observation Hall offers one of the best points to view Lake Chuzenji and the mountain range in the distance. By taking a look at the exhibits, you'll learn more about the features of Nikko's natural environment, especially about the many types of trout inhabiting the lake, as well as about the history of this boat house which has been a socializing place for foreign diplomats and other visitors for a long time. Fixed holidays No closed days from June to October. In April, May and November, closed every Wednesday (if it falls on a holiday, the following day). Access 60 minutes by bus from Tobu Nikko Station or JR Nikko Station. Take the bus for Yumoto Onsen and get off at Chuzenji Kanaya Hotel-Mae. To reach our next destination, the Lake Chuzenji Boat Cruise Station, take the bus departing at 9:39 for Nikko Station from Chuzenji Kanaya Hotel-Mae bus stop. You'll reach Fune no Eki Chuzenji bus stop at 9:45. Don't forget you have to show your Nikko Pass both when you get on and when you get off the bus. The Lake Chuzenji Boat Cruise is also covered by your Nikko Pass so please show your pass to the staff at the ticket office. See what time the next ferry will leave (10:30, on some days the first ship may depart at 10:00) and get in line. During the one-hour cruise, you'll hear explanations in English about how Lake Chuzenji was formed through a volcanic eruption of Mt. Nantai, as well as about the features of this lake and of the nature surrounding it. Passengers can enjoy the cruise either on the deck or from inside the ferry. The ship called Nantai is provided with a private room which can also be reserved in advance. This room can accommodate up to 8 persons, it includes a private deck and offers a great view of the surroundings. One of the fascinating sights that can be experienced during the Lake Chuzenji Boat Cruise is Kozuke Island, which is said to be housing the grave of the ancient ascetic Shodo Shonin, the founder of Nikkosan. Shodo Shonin, a monk who lived in the Nara period (710 - 794), came to this area compelled by the vision to build a temple for Buddhist worship in eastern Japan. Once he reached the area that is now Nikko, the ascetic was enraptured by the beauty of this region. In 766, he founded here a temple called Shiunryuji, which is now Rinnoji Temple. In 782, after many hardships, he finally managed to reach the peak of Mt. Nantai and founded a small shrine there which is nowaday's Futarasan Okunomiya Shrine. Access 8 minute walk from Chuzenji Onsen Bus Stop. 45 minute bus ride from Tobu Nikko Station. 12:45 - 13:45 -- Lunch at Nikko Kanaya Hotel - Arguably the Best Curry Rice in Japan! After the boat cruise, it's time to leave Lake Chuzenji and Oku-Nikko behind and head to the city. Take the 11:50 bus heading to Nikko Station from Fune no eki Chuzenji bus stop. After a 41-minute ride, get off at Shinkyo bus stop. A few meters away up the hill is our next destination, Nikko Kanaya Hotel, where we suggest stopping for lunch before visiting the World Heritage Sites. Nikko Kanaya Hotel is one of the most sought-for accommodations in Nikko. Its history goes back to the beginnings of the Meiji Period (1868-1912) when Kanaya Zen'chiro opened his home toward visitors operating it as a cottage inn. It was one of the first facilities to open its doors to foreign tourists during the time when Japan intensified its relations with the West at the end of the 19th century. Among the famous international guests that stayed at Nikko Kanaya Hotel were J.C. Hepburn, whom we owe the Hepburn style romanization of Japanese words, Isabella Bird, author of a travel book on Japan, and Albert Einstein. Take a few moments to explore the precincts of the hotel, both inside and outside. Each and every corner is full of history and retro charm. Our recommendation for lunch is the One Hundred Year Curry Rice menu (2,100 yen) offered at the Craft Lounge, the coffee lounge located on the first floor of the main building. Made from a recipe that is one hundred years old, the curry sauce is so smooth and rich that it might just be the best curry you'll eat in Japan! After your lunch at Nikko Kanaya Hotel, go past Shinkyo Bridge (which is part of Nikko Futarasan Shrine) and up the stairs toward Toshogu Shrine, Rinnoji Temple and the main hall of Nikko Futarasan Shrine. All the buildings in this area used to be part of Nikkosan, a large temple-shrine complex that occupied the entire area of Nikko, including Oku-Nikko (the area around Lake Chuzenji). Ever since the first temple was built here in the 8th century, Nikkosan developed as a center for religious worship. Its main feature was the syncretism of Buddhist and Shinto beliefs. Traces of this syncretism can still be found in the shrines and temples of Nikko. First, we recommend visiting the Sanbutsudo Hall of Rinnoji Temple. Although it is being restored now (*1), access is permitted inside the hall. Here, visitors can see three magnificent wooden Buddhist statues which are approximately 7.5 meters high. These are the statues of Amiddha Buddha, Kannon Boddhisatva, and Bato Kannon. These holy figures from the Buddhist pantheon have been associated with Mt. Nantai, Mt. Nyoho and Mt. Taro, the three mountains surrounding Nikko. All used to be worshiped as sacred in ancient times. *1... As of September 2018. Right in front of the Sanbutsudo Hall is the Treasure Hall and Shoyoen Garden, a Japanese garden built for the head priest of Rinnoji Temple, who, in the Edo Period (1603 - 1868), by tradition was to be elected from among the imperial princes that had taken Buddhist vows. The lake in this garden is said to be a miniature image of Lake Biwa as it can be seen from Enryakuji Temple, the most influential Tendai sect temple in Japan. The garden is especially beautiful in autumn. From the many buildings on the grounds of Rinnoji Temple, we especially recommend visiting the Taiyuin Mausoleum erected in honor of Tokugawa Iemitsu (1604 - 1651), the third shogun of the Edo period and grandson of Tokugawa Ieyasu (1543 - 1616) who founded the Tokugawa shogunate and is buried at Toshogu Shrine. It had been Iemitsu's wish to be buried close to his grandfather, whom he admired deeply. It is said that, out of respect for Ieyasu, Iemitsu wanted for his mausoleum to be decorated in a rather subdued manner. Although Taiyuin does not have the opulence of Toshogu Shrine, it is nonetheless a magnificent building. Do take the time to explore it on the inside and its surroundings which are full of Buddhist art and objects with a fascinating historical background. Access From Tobu Nikko Station or JR Nikko Station take the "World Heritage Sites" bus for 10 minutes. Get off at Shodo Shonin-Zo Mae bus stop. Treasure Hall and Shoyoen Garden: Adults 300 yen, Elementary School Children 100 yen. Toshogu Shrine is famous for housing the grave of Tokugawa Ieyasu, the founder of the Tokugawa Shogunate (1603 - 1868) which brought peace to Japan after more than a century of internal conflict and political unrest. The history of this shrine is deeply connected to the history of Rinnoji Temple and the Nikkosan. This is why you'll see a Buddhist five-storied pagoda even after going through the large torii gate that stands at the entrance to the shrine. Starting with the gorgeous Yomeimon Gate, the Chinese-style Karamon Gate, the Prayer Hall (Haiden) and the Main Hall (Honden), all the buildings on the precincts of Toshogu Shrine are extremely elaborate and beautiful. No effort was spared to honor Shogun Ieyasu whose rule brought the beginning of a new era for Japan. These buildings are one of the greatest achievements of early Edo Period architecture and art. The history of Nikko Futarasan Shrine, one of the most influential shrines in Eastern Japan, is also deeply interwined with that of Rinnoji Temple. The main hall of Nikko Futarasan Shrine is located near Rinnoji and Toshogu Shrine. However, visitors to Oku-Nikko will find buildings pertaining to this shrine all around Mt. Nantai, the main object of worship at Futarasan Shrine. The deity enshrined here is considered to be the protector of marriages and human relationships. That is why it is a popular shrine for weddings. The sacred Shinkyo Bridge can be crossed by visitors only halfway through, but the couples who get united at Nikko Futarasan Shrine have the privilege to cross it all the way to the other side. This time we introduced recommended itineraries for a trip to Nikko using the Nikko Pass all area. 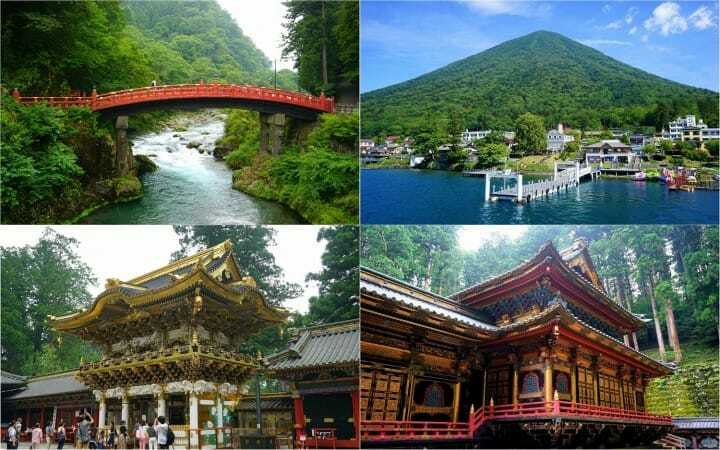 This pass is good for 4 days, so, after spending one day in Oku-Nikko and the second day in Nikko City, how about heading to Kinugawa Onsen or Nikko Edo Wonderland on your third and fourth days? Kinugawa Onsen is a resort area with splendid nature and hot springs. We highly recommend a trek along Kinugawa River through the Ryuokyo Gorge, as well as a visit on Monkey Mountain, a place famous for the monkeys that greet the visitors, using the Kinugawa Onsen Ropeway. As for the 4th day, how about visiting Tobu World Square, an architectural museum with miniature reproductions of 102 famous buildings from all around the world? You could also spend a day at the exciting Nikko Edo Wonderland, a historical theme park. Holders of the Nikko Pass benefit from discount entry fees to these facilities. Enjoy your trip using the Nikko Pass, the most convenient discount ticket for exploring the Nikko area! For more information on tourist sites in Nikko and the Nikko Pass, please visit this official webpage dedicated to the Nikko Pass.